Accomplished modernist architect Eason Cross died on January 28, 2016. A Fellow of the American Institute of Architects, Cross was a principal of Cross & Adreon, a firm known for modernist residential developments designed to harmonize with nature. Their projects received prestigious design awards when they were first built 50 years ago, and these communities have continued to receive recognition for being outstanding places in which to live. The work of Cross & Adreon was recently featured in David Frey’s “30 Great Neighborhoods” in the current issue of Bethesda Magazine (Mar/Apr 2016) (pdf). Cross worked seven years in the offices of prominent local architect Charles Goodman, first as draftsman and later as associate architect. In this capacity, he designed houses in Hollin Hills where he became a resident, raised a family, and was a community leader. From Goodman, Eason learned that good architecture would benefit society and he followed Goodman’s example of striving to provide well-designed housing for a broad audience. Cross had earned a Masters of Architecture from Harvard (1951), where he studied under pioneering modernist Walter Gropius, founder of the Bauhaus School. 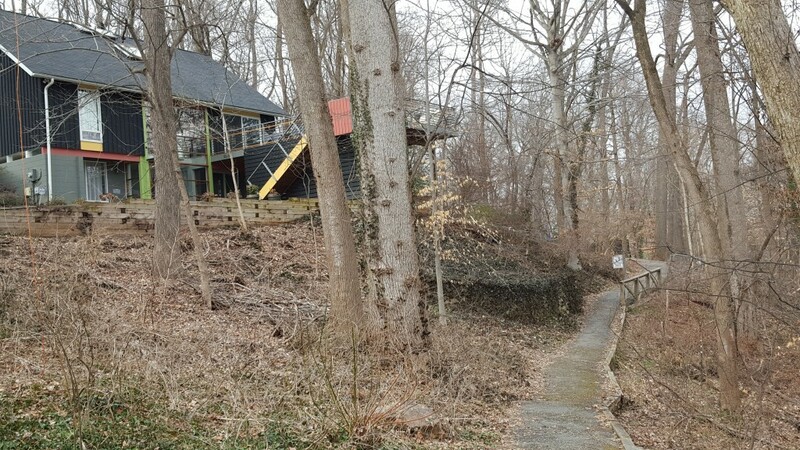 In Montgomery County, Cross & Adreon partnered with developers Matthews-Schwartz in bringing clusters of houses designed for nature, built into wooded hillsides and often adjoined parks or streams. Notable projects include Wynkoop Court, as well as projects in Mohican Hills and Bradley Park. Wynkoop Court (1965) received an award for community design from AIA Mid-Atlantic Region and a design award from the Bethesda-Chevy Chase Chamber of Commerce. Thoughtfully sited houses stepped into the hillside are accessed by shared driveways, boardwalks, and stairways. Expansive windows bring nature into living space. Terraces and balconies extend living space into the wooded landscape. The Wynkoop Barn House model received a 1966 Homes for Better Living award in a competition sponsored by the American Institute of Architects and House & Home. The compact 2,600 sf house contained six bedrooms and three baths on a small footprint with attic and basement. House & Home wrote, “There’s a regrettable tendency in the homebuilding industry to consider unusual, interesting design the sole province of the custom-built house, and to relegate the built-for-sale house to the so-called safe category of ordinary, sales-proven design.” In presenting a design award to the Wynkoop Barn House, House & Home found proof that the two markets can overlap from the standpoint of design. 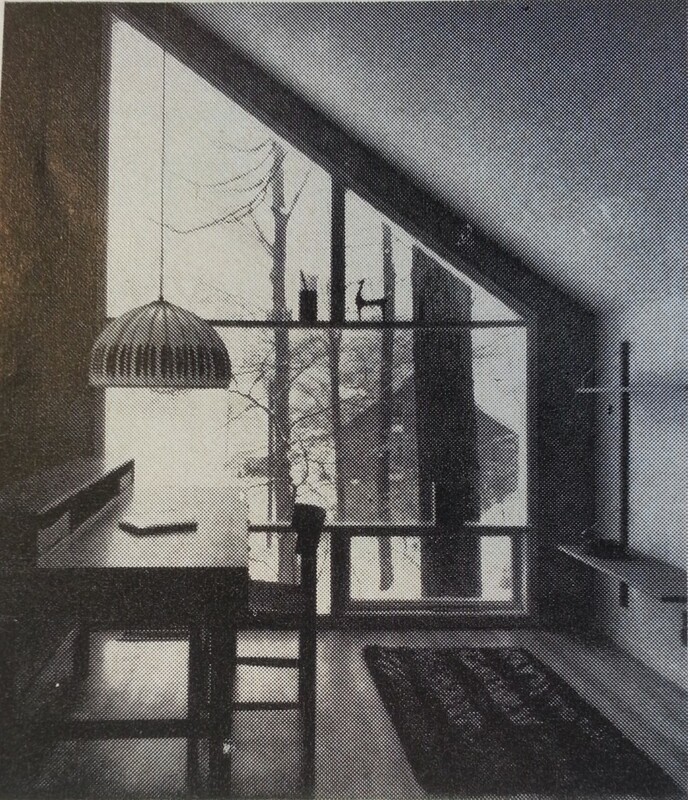 House and Home featured the Wynkoop Barn House in its October 1966 issue, photographs by Warren Ballard. 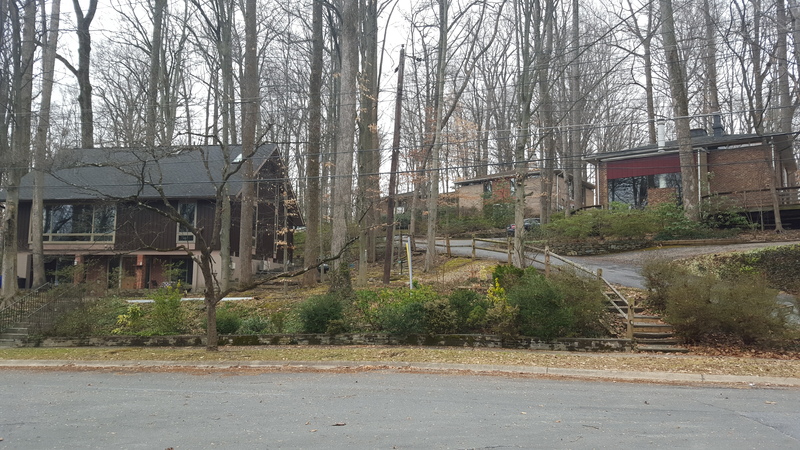 On Mohican Road, in Mohican Hills, Cross & Adreon designed a cluster of seven houses for a steep, wooded site adjoining a park. Houses are connected with shared driveways. 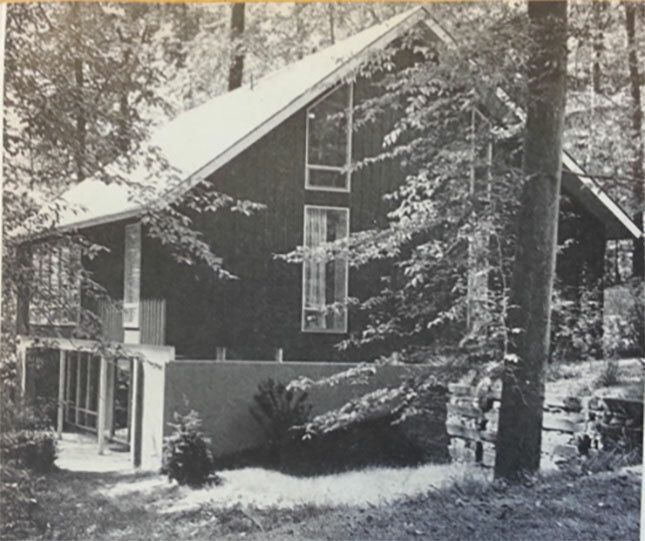 The Mohican Hills Square House received a House and Home award (1966). A rustic walkway meanders between the modernist houses. 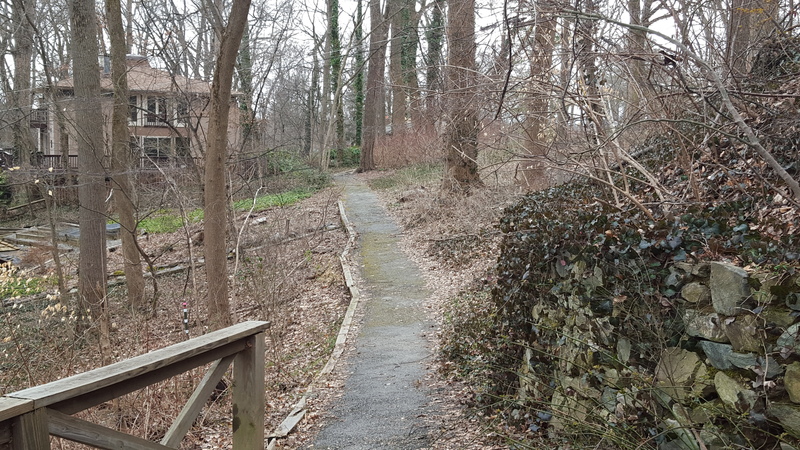 The walkway connects the community with the adjacent M-NCPPC Glen Echo Heights Neighborhood Park, established in 1960. Mohican Hills sold out two weeks before the scheduled opening. The architects carefully considered vistas from houses as they situated the buildings on sloping, wooded lots. 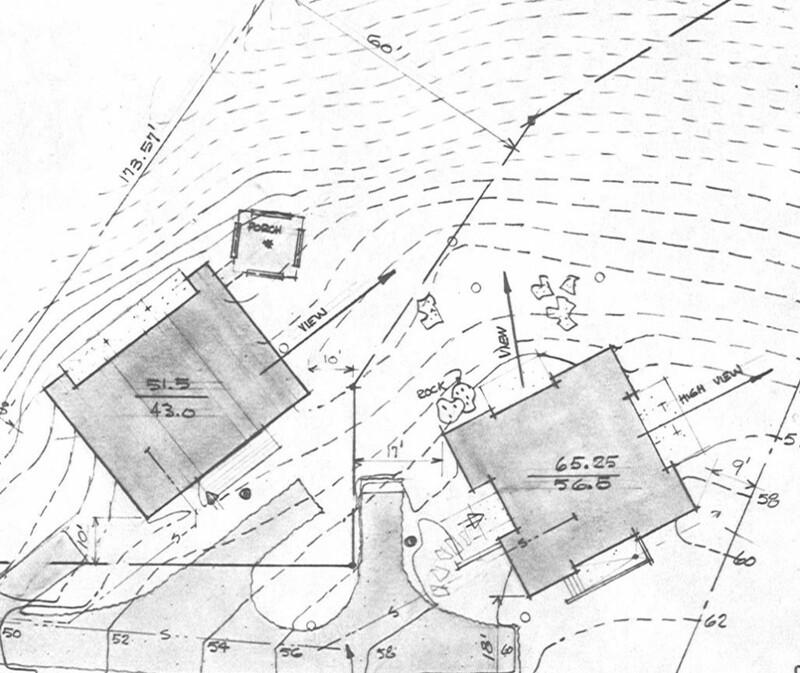 This plan shows how viewsheds were orchestrated harmoniously for neighboring houses on Wiscasset Road. Dotted lines indicate the steep topography. 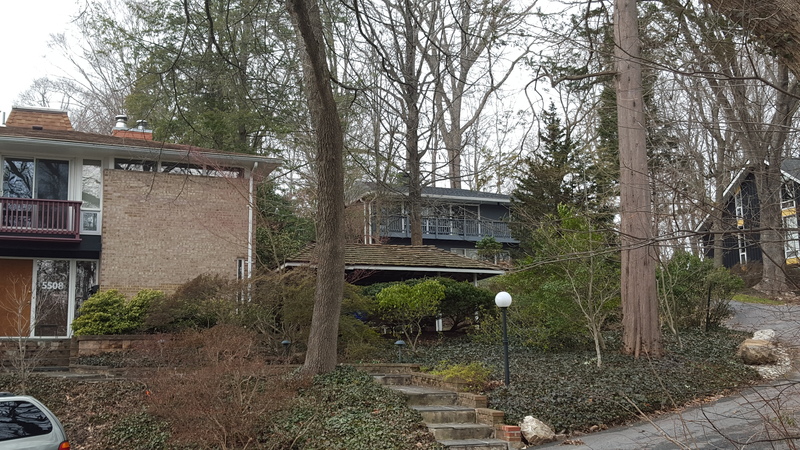 Other projects include Bradley Park (1966), Whittier Boulevard, Bethesda, and Williamsburg Gardens (1974), Holbrook Lane and vicinity, Potomac. 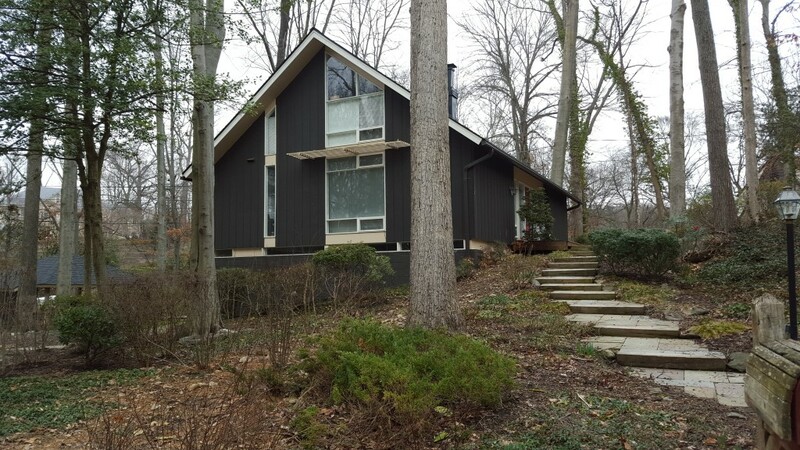 This Bradley Park model with clerestory windows won a 1967 award from AIA and House and Home. 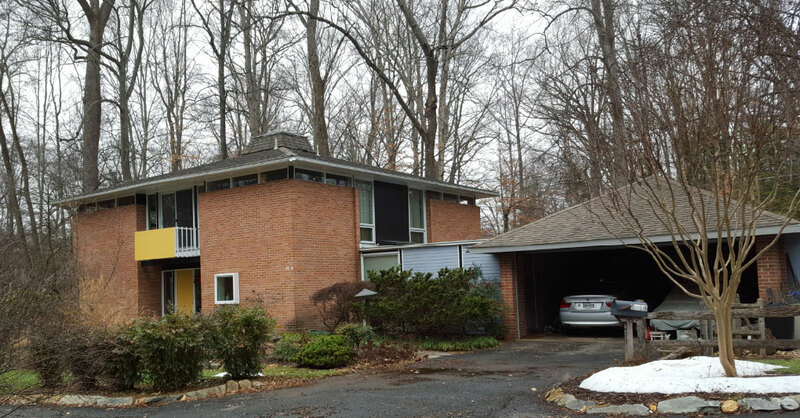 The award-winning projects of Cross and Adreon are included in Montgomery Modern: Modern Architecture in Montgomery County, Maryland, 1930-1979. The book also includes a biographical sketch for Eason Cross in the Practitioners Appendix. Thanks to my colleague Joey Lampl who interviewed Eason Cross and consulted his papers, in her intensive research on Charles Goodman. For more on Eason Cross, see his obituary from the Washington Post (pdf). Montgomery Modern explores mid-century modern buildings and communities that reflect the optimistic spirit of the post-war era in Montgomery County, Maryland. From International Style office towers to Googie style stores and contemporary tract houses, Montgomery Modern celebrates the buildings, technology, and materials of the Atomic Age, from the late 1940s through the 1960s. A half century later, we now have perspective to appreciate these resources as a product of their time.